This body of works is about the process of applying and juxtaposing fragments of paintings in order to merge them into new and coherent images. I start the work with a large painting on paper, which I paste onto canvas. 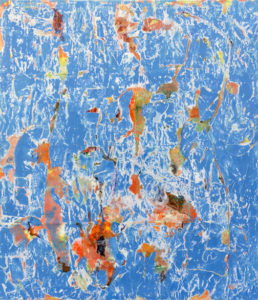 I then sand the surface of the painting, tearing and removing the areas that have not completely adhered to the canvas. 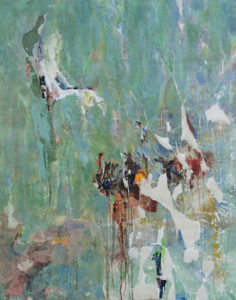 This creates a new image composed of distressed fragments of the original painting. Next I proceed to manipulate the images in order to create new ones. I often collage rust, graphite, fabric and paper as well as paint onto the surface in order to create the finished pieces. The final images are surprising visuals combining the arbitrary with the intentional. 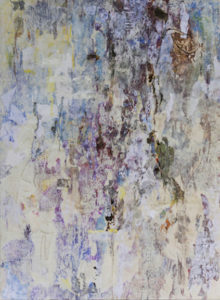 Faded, ghostly images of the initial surfaces merge with the bolder, brighter layers that were added on top. These intriguing and complex surfaces convey vulnerability along with dynamism. Manipulating and destroying finished paintings in order to create new ones invokes the reexamination of cultural legacies and historical events and their influence on the present. Nurit Avesar was born and raised in Israel. She moved to Los Angeles, CA in her twenties. During her early art career she worked as a graphic designer and an illustrator, which she eventually quit in order to raise her family. 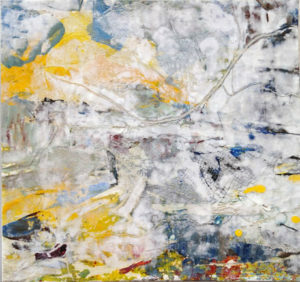 In 2007 she went back to school and in 2010 completed her MA in studio art at California State University, Northridge. She is currently an artist-in-residence at Studio Channel Islands Art Center in Camarillo, CA. Avesar is the 2010 recipient of a Dean Purchase Award. She had a 2016 solo show at the Neutra Institute Museum of Silver Lake and a major show in 2015 at the Brand Library and Art Gallery. She is a member of the Los Angeles Art Association and the Southern California Women’s Caucus for Art and is represented by Gallery Yoram Gil.